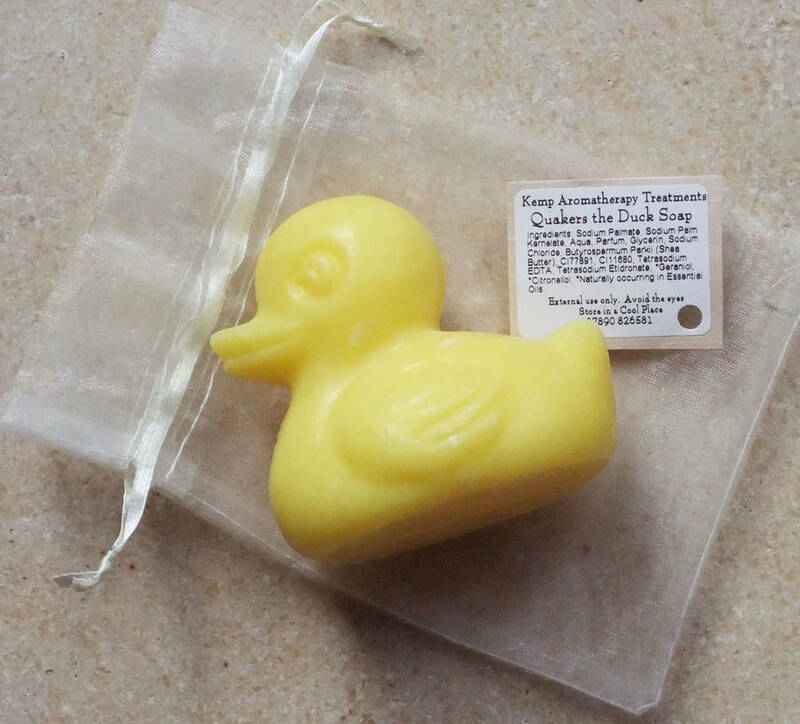 Quackers the duck soap - beautifully presented in a cream organza bag or black box. This beautiful triple milled pure vegetable soap is a great fun present for all ages. It is enriched with Shea butter and Vitamin C. Another perfect gift from KAT aromatherapy. This novelty duck soap can be used in the bath or shower or purely as a decoration in the bathroom as it smells divine. sodium palmate, kamelata, aqua, parfum, glycerin, sodium chloride, butyrosparmum parki (shea butter)C177891, C11680, tetrasodium, EDTA, tetrasodium etidronata, geraniol*, citronellol*, *naturally occuring in essential oils. This product is dispatched to you by Kemp Aromatherapy Treatments.